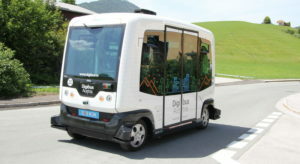 In the last week of May, the self-driving minibus was programmed with a new test track in the municipality of Koppl (Salzburg). The new route leads from the community center to the turnoff to Hinterschroffenau and has a length of approximately 650 meters. As a test vehicle in the project the model EZ10 of the French manufacturer EasyMile is used. First test drives for research purposes have already been carried out. Dates for public test drives for interested persons are announced here in this section under “News”. The Transport Research Arena (TRA), Europe’s largest transport research conference, took place in Vienna from 16 to 19 April. The flagship project “Digibus® Austria” was presented at the conference. 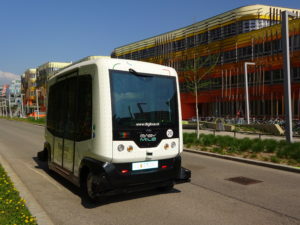 The autonomous vehicle EZ10 of the French manufacturer EasyMile was available for test rides during the congress. A total of 274 congress visitors particpated in the test drives over the four days. Following the TRA, the autonomous vehicle was transported to the municipality of Koppl in the Salzburger Flachgau region where it will be used for research purposes within the scope of the project “Digibus® Austria” now.